To view a full album of muirburn images from Dunmaglass Estate, visit our Gift of Grouse Gallery. 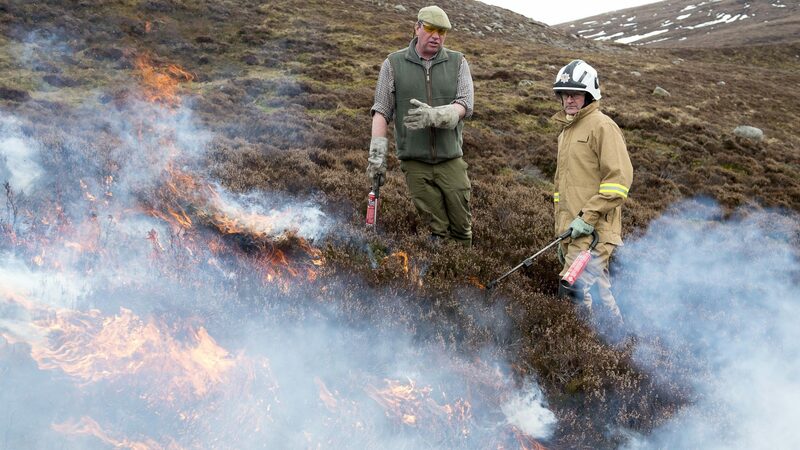 Gamekeepers are embracing the new Muirburn Code – and sharing their expertise with fire crews who battle wildfires across Scotland’s countryside. The official end of this year’s muirburn season (1 October – 15 April) has now been reached – a controlled burning technique which has been used for centuries on moorland to regenerate Scotland’s famous purple heather on our hills whilst protecting against wildfires. Alex said: “The SFRS recognises the cost of tackling wildfires, whilst using key resources that could be diverted from emergencies such as Road Traffic Collision and house fires. The SFRS also recognises that the damage caused by wildfires to the natural habitat can be catastrophic. The revised code has also placed more emphasis on soil and water management such as keeping fire-free buffer zones adjacent to water courses and water bodies. Specific guidance on burning for grazing has also been outlined and more emphasis placed on the potential of cutting, in addition to, or as a replacement to burning. Burning should only take place on peatland more than 50cm in depth as part of a restoration plan, with Scotland’s peatlands one of the county’s most important natural assets in capturing carbon, improving water quality and supporting biodiversity. Commenting on the revised Muirburn Code, Ronnie said: “We’ve found the new code is working well in most aspects. Our equipment on this estate is second to none and because we have the expertise and the management techniques it means the fires don’t burn out of control. Grouse moors don’t have a problem with wild fires – it’s a long-established technique. “I’ve been carrying out muirburn since the 1970s and the environmental benefits are clear. The sphagnum moss benefits from rotational heather burning and so do mountain hares and waders. On our estate we have curlew, golden plover, snipe and peewit faring well. Managed grouse moors are by far the best habitat for these birds because of the young heather, which is where they make their nests.